For those who had Martin Luther King Jr. Day off yesterday, wasn't it nice to have a long weekend even though the holidays just passed? It is definitely one of those, "need a vacation after the vacation" type of feelings. 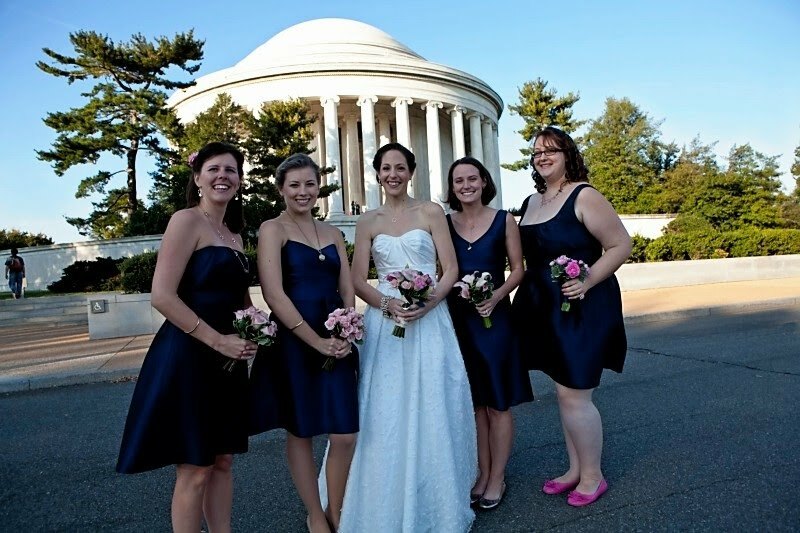 Today we are happy to share some photos from Rachael, another Washington DC bride who was married this past October. 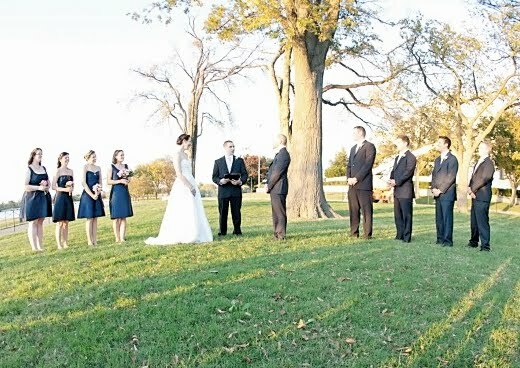 It's nice that even in the late fall, it was warm enough to have an outdoor ceremony! Rachael's bridesmaids wore mixed styles of the popular Alfred Sung line in dupioni fabric and the color Midnight. 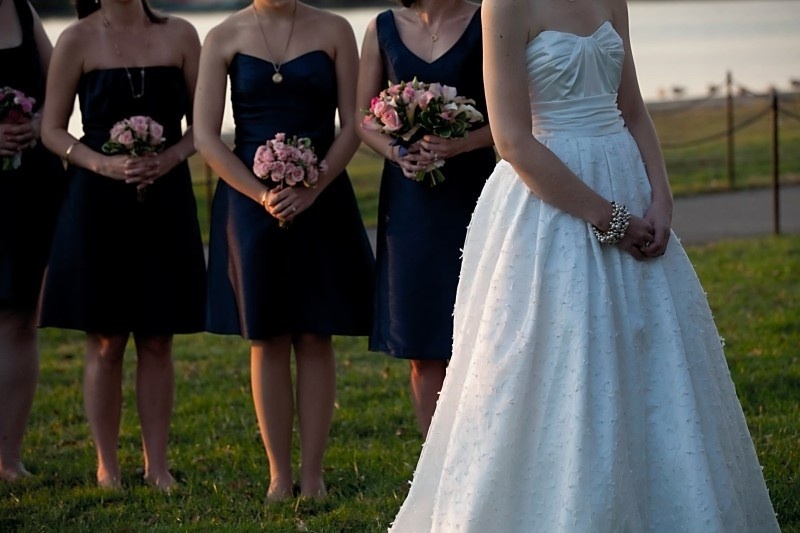 The bridesmaids' different gold necklaces and flats also added individuality to their outfits. 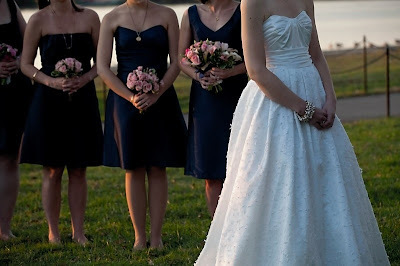 We love Rachael's unique wedding dress with a sweetheart bodice and a fully beaded ballgown skirt, minimally styled with a chunky gold bracelet. Coincidentally, one of the bridesmaids just got engaged and chose a different Alfred Sung style for her wedding, so now it's Rachael's turn to be a bridesmaid! 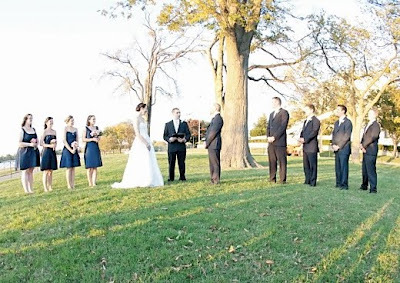 Thanks Rachael for sharing your special day with us. We hope you and your husband are blissfully enjoying married life!